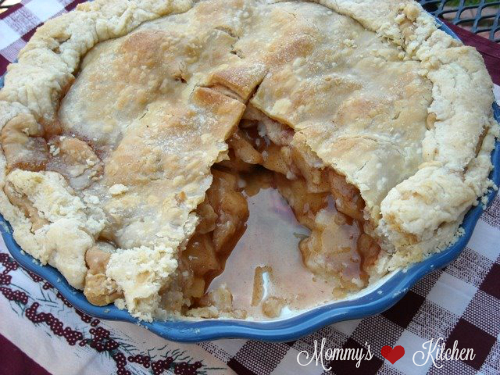 This Classic Apple Pie 🍎 has a flaky crust with a delicious filling made from apple cider, vanilla, spices and two varieties of apples (golden delicious and granny smith). Today I want to highlight another recipe that I made for our Holiday Dinner. I wanted to make a homemade pie for Christmas, so I thought this delicious Apple Pie would be perfect. Actually this is the third time I've made this wonderful pie, so I guess you can say I'm a bit obsessed with it. This recipe is really easy to prepare and I love the addition of the apple juice. 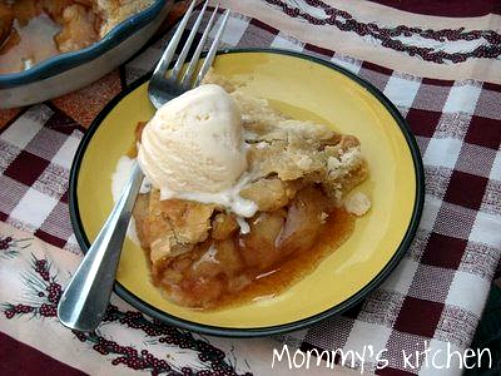 Apple pie is my youngest sons favorite, so a big thank you to Christy's mom for sharing this recipe. 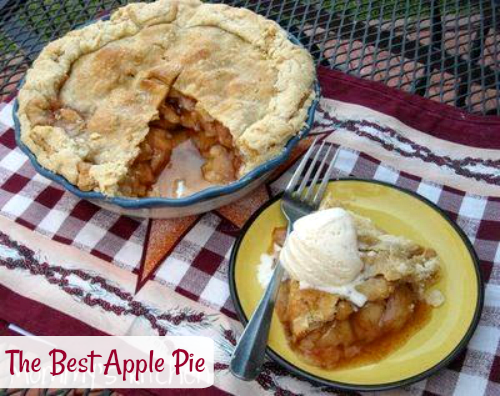 The apples in this pie, pile up perfectly and the pie looks beautiful when you cut the first piece. Instead of slicing or chunking the apples in this recipe that apples are cut into chips. By cutting and chipping the apples they layer nicely and the first thing you see when this pie is cut is layers of stacked apples. This recipe is easy peasy to follow, so even a first time pie maker can handle this recipe. If you would rather use a homemade pie crust versus store bough, I have included a recipe at the end of this post. It really just depends on how much time you have on your hands. Homemade by all means is the best but, sometimes I get in a pinch and store bought pie crust comes through for me every time. Lets get started and make some apple pie! Start by preheating the oven to 425 degrees. Unroll and place one pie crust on the bottom of a 8 or 9 inch pie plate. Peel and cut apples into 1/4 inch size chips (see above) and place in a large bowl. In separate medium size bowl, combine all dry ingredients and add to the apples. In a small bowl combine all the the liquid ingredients. Pour the liquid ingredients over the apples and toss the apple mixture to combine. Spoon the apple mixture into prepared pie crust. Place the second crust over the apples and press both pie crusts together to seal edges. Fold the edges over towards the middle of the pie and then crimp the edges with your fingers. Cut a few slits on the top with a knife so the steam can escape. Melt the butter and brush over the crust. Sprinkle a bit of sugar on top before baking. Place in oven and bake at 425 degrees for 15 minutes. Remove pie from oven and cover the entire pie with foil (leaving the center open, see above picture). You just want the outer edge covered to prevent it from burning. Reduce heat to 375 and continue baking for 45-55 minutes or until golden brown. Remove foil and cool completely before serving. Look how beautiful!! This is the best apple pie I have ever made. The flavors infuse together so nicely. Preheat oven to 425. Unroll and place one pie crust on the bottom of a 8 or 9 inch pie plate. Peel and cut apples into 1/4 inch size chips (see above in photo) and place in a large bowl. In separate bowl, combine all dry ingredients and add to the apples. In a small bowl combine all the the liquid ingredients. Place the second crust over the apples and press both pie crusts together to seal edges. Fold the edges over towards the middle of the pie and then crimp the edges with your fingers. Cut a few slits on the top with a knife so the steam can escape. Melt the butter and brush over the crust. Sprinkle a bit of sugar on top before baking. Place in oven and bake at 425 degrees for 15 minutes. Remove from oven and cover entire pie with foil (leaving center open, see above picture). You just want the outer edge of the pie covered to prevent it from burning. Reduce heat to 375 and continue baking for 45-55 minutes or until golden brown. Remove foil and cool completely before serving. Cook's Note: If you are looking for a homemade pie crust recipe I happen to stumble on a great recipe below. Mix flour and salt. Using a pastry blender cut butter and shortening. It should be a bit crumbly with the chunks of dough about pea size. Add water 1 tablespoon at a time. Be careful because you do not want this to become too wet, so add 1 tablespoon at a time. Mix until it forms into a dough. Form into a ball and flatten into a disk and wrap in plastic wrap. Refrigerate for at least one hour. You want this cold. Cut the dough in have and roll dough out and place in a pie pan. Roll out a second crust and place on top. This is a gorgeous looking pie!! I like the idea of cutting the apples into chips. I'm going to have to try that. What a wonderful looking pie! Great idea to cut the apples into pieces. YUM!! Hey Tina!!! I am so jealous! I wish I were there!! I love this pie but I can't imagine how much more I'd love it if someone else cooked it for me!! Thank you for the Southern Plate shout out, as always!!!! That pie is just beautiful! You did a great job. I know what you mean about Southern Plate recipes - every one that I try turns out wonderful too! That's a good looking pie...what's the inside like? I made the chocolate pie for my Dad. He is a diabetic so I used Splenda for the sugar and left out the vanilla. It was sooo good. I Used carnation milk. The pie was so creamy and great. Thank You. I made the strawberry cake for my husband, he loved it. Not too sweet. My next project is the apple pie. I am so thankful I found your website. Wow! It's look really delicious. What a lively apple pie. Happy holidays and Happy New Year! I made the Southern Plate Apple Pie & it is the best apple pie I have ever eaten!!! My family agrees too! Such an easy recipe. Thanks so much for sharing! This will be the only apple pie I will ever serve!!! Love Love Love it!!! I am French so I don't know what good old lard is.... Can you tell me please so I can find something similar.